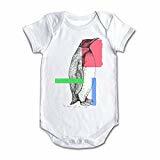 100% Cotton Funny Bodysuit Onesies. Soft and comfortable, breathable feeling. Original, exclusive design toddler clothes. Perfect for dress-up for everyday wear,Best gift for your Baby. Fast Shipping With 7-14 Days . we specialize in using only the highest quality materials and artwork. We only carry the softest onesies, gentle for your babies skin. Our made-to-order funny baby onesies are the perfect gift for any occasion.